Victoria Times Colonist, December 15, 2012—Before I moved to Saanich, I never thought a person could suffer from sidewalk envy. But here I am, living on a somewhat busy street in a neighbourhood that shed its last rural traces decades ago. On one side of the street, a ditch drains stormwater and runoff. On the other side, a narrow, raised ribbon of asphalt separates a strip of tarmac from the roadway. That strip is the sidewalk. It’s usually adequate. Thanks to “no parking” signs on every power pole, nobody parks on it for long anymore, but during storms, entire sections become rivers. Its narrowness forces users to step into traffic when they meet oncoming pedestrians. Kids and parents troop up and down that strip to the schools at the end of the street every school day. I’m thankful for this bit of pedestrian-only tarmac, yet every time I step out my door and head down the hill, I covet the sidewalks of Oak Bay and Victoria—concrete sidewalks, sidewalks raised inches above real gutters, lining most streets, lining both sides of streets…. In the 2012 CRD Regional Pedestrian and Cycling Masterplan, which despite its title is largely about cycling, the authors state one of the reasons they don’t identify pedestrian-trail networks in the document is that most municipalities in the region lack detailed information about sidewalks, curb let-downs, and marked crossings. Indeed, great disparity in pedestrian information and facilities exists here. 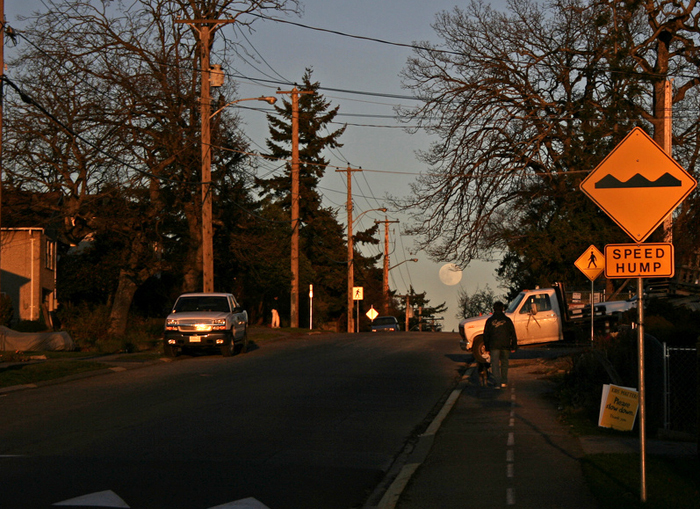 Esquimalt, with its 2007 Pedestrian Charter explicitly committing the township to developing pedestrian facilities and networks, is a high point. Oak Bay and Victoria do well by their walkers, as well. View Royal also has some lovely pedestrian boulevards. And then there are large areas of urban Saanich. The municipality is playing catch-up on decades of residential development that omitted sidewalks. Every year, engineers and crews now retrofit a few more kilometres of raised, curbed walkways along busier streets. The masterplan’s authors provide a second reason for not dwelling on pedestrian matters: pedestrians tend to walk locally—on local streets, through local parks, to nearby banks, libraries, shopping—and in combination with other forms of transportation—to and from bus stops, bike racks and parking lots. With such foot-traffic patterns, the authors say, pedestrian-related efforts should focus on developing access to regional services, centres and transportation hubs. However, among the 10 percent of regional residents identified as regular pedestrians, a small but significant number of people regularly walk four, five or six kilometres across entire municipalities twice a day to get to offices or appointments. I know individuals who walk or used to walk to work from near Oak Bay Village to Blanshard Street, from near Macaulay Point to the Inner Harbour, from Hillside Avenue to Cook Street Village, and from Carey Road to Fort Street. Why are people like these discounted? It’s strange to live in a community where something so fundamental as walking is overlooked. If pedestrians in the region feel disenfranchised, well, they are. It sometimes seems dogs, with their impassioned owners, have a greater voice around here than pedestrians do. The region’s foot soldiers could learn from the Greater Victoria Cycling Coalition, formed in 1992 to advocate on behalf of cyclists. Instrumental in developing the Galloping Goose Trail, the organization is now providing input into the E&N Railway Trail. It actively solicits members for participation and comment on cycling-related issues and initiatives such as the Pedestrian and Cycling Masterplan and on road-safety improvements to routes such as the Shelbourne Street corridor and Admirals Road. It is involved in Bike to Work Week, it offers regular safety clinics to area cyclists, and helps keep cyclists’ interests on each municipality’s agenda. Way to go! The coalition has earned its successes through hard work and clear vision. So, pedestrians of Victoria, in these dark days of the year when your own are being injured and killed in marked crosswalks and fingers are being pointed and wagged at you, consider this: Are you upset enough with the current state of pedestrian matters to unite your disparate selves, find your collective voice, and begin advocating for your own safety, rights, interests and needs? A version of this article appeared in the Victoria Times Colonist.